More of the world's biggest marketers are selling their stuff at the place where consumers hanker to hang out: Facebook. Think of it as the ultimate convenience for a mobile generation that considers it seriously inconvenient to leave Facebook — even for a moment — in order to go to a retailer's website. Now, marketers from Express to J.C. Penney to Delta Air Lines are steering those purchases to their Facebook pages. Within a few years, social media gurus say, the very notion of shopping on a retailer's website will become dated. "Expecting people to come to your website is expecting them to make an extra effort," explains Janet Fouts, a social media coach. "They're already on Facebook." The numbers are dazzling. Facebook has roughly 500 million users — 250 million of whom are on the site every day. The average user has 130 friends. Each month, people spend a total 700 billion minutes on Facebook. "It's social networks like Facebook that are the center of people's lives," Fouts says. "It's where their friends are. It's where they play games. And it's increasingly becoming where they shop." Facebook executives say it's critical to make Facebook stores friendlier than websites. "Retailers who provide deeply social shopping experiences will see the most success," says David Fisch, director of commerce partnerships. Among the most recent to make the Facebook e-commerce move is Express, the apparel chain. About two weeks ago, it started selling its entire line via its Facebook page. An inventory calculator tells consumers if the item is available. "Clearly, we won't be the last to do this," says Lisa Gavales, chief marketing officer at Express. •J.C. Penney. The retailer rolled out a Facebook shopping app shortly before Christmas. The commerce tab on its Facebook page provides a "full shopping experience" without leaving Facebook, spokeswoman Kate Coultas says. •1-800-Flowers. Nearly two years ago, 1-800-Flowers was among the first retailers to open a store on its Facebook page. "We're always looking to embrace new waves of commerce," President Chris McCann says. •Delta. Since August 2010, Delta has been selling airline tickets from an e-commerce store dubbed Ticket Counter on its Facebook page. 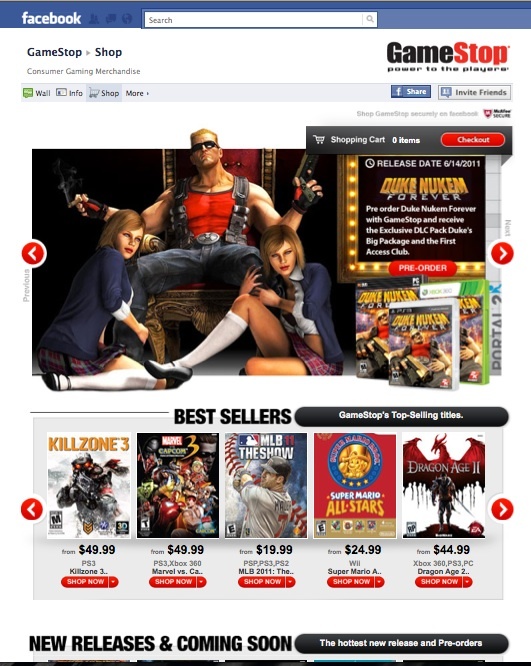 •GameStop. 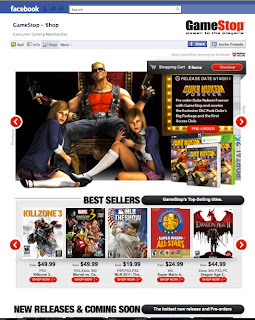 Early last month, the video game retailer launched a storefront on Facebook. How Do I Get People to Like My Brand on Facebook?